Nowhere else in the world can you see the very best drivers from Australia’s top series, the Virgin Australia Supercars Championship, going head-to-head with the best GT and SportsCar drivers from across the globe. Bathurst is that place and showcases a) how good our guys are against the world’s best and b) how good the world’s best actually are! The entry list now includes many of the top full-time drivers from the Virgin Australia Supercars Championship, including former Champions Craig Lowndes, Jamie Whincup, Garth Tander and Shane van Gisbergen. There are former Bathurst 1000 winners aplenty – Lowndes, Richards, Longhurst, Tander, Mostert and Whincup amongst them. 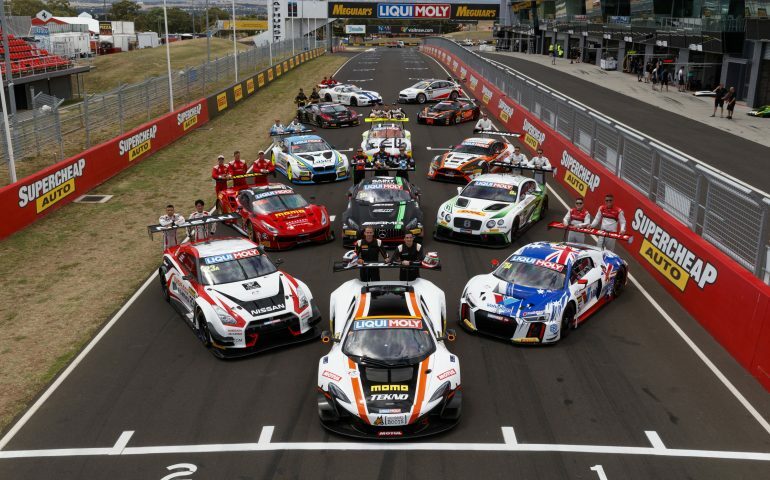 Of those drivers, Lowndes, Whincup and Longhurst have also won the Bathurst 12 Hour outright, as has Shane van Gisbergen, Craig Baird, Christoper Mies and Rod Salmon. Between them they account for 10 12-hour victories. There’s Bathurst 24-Hour winners, open-wheel champions and more from these shores and across the Tasman for local fans to cheer on. There’s even some famous surnames starting afresh in third-generation stars like Aaron Seton and Matt Brabham. But what of the internationals? It’s a fine bunch, that’s for sure. There are already factory drivers confirmed from Audi, Porsche, McLaren, Bentley, BMW and Mercedes AMG, while the list also includes LeMans winners, DTM champions and winners of a majority of the major international enduros like the Spa and Nurburgring 24 Hour epics. There will be more than 200 Formula 1 Grand Prix starts on the Bathurst grid, multiple LeMans 24 Hour winners and world champions in GT and sports Car racing. They all want to prove themselves against the Mountain. It makes for a melting pot of talent, accents and more in Australia’s most cosmopolitan racing paddock of the season.